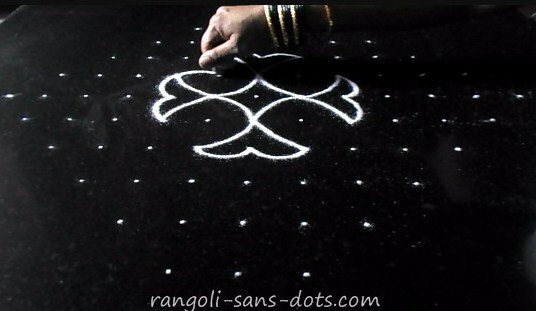 The lotus rangoli above is with a dot pattern 13 to 1. Draw the simple design at the centre. Add the four lotuses coloured pink on four sides. 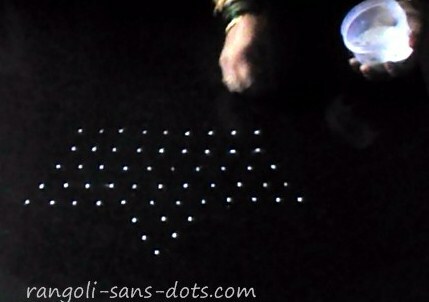 Connect the remaining dots to use them up as shown. 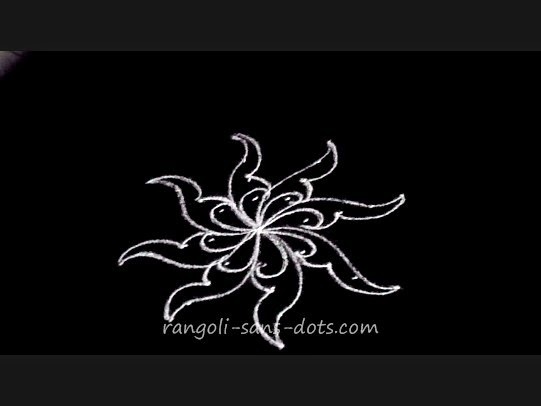 A very beautiful flower rangoli. . 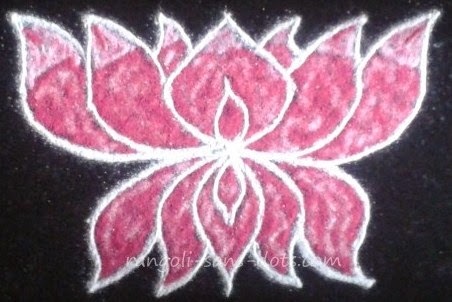 In case you want to draw a single lotus free hand version it is given below. 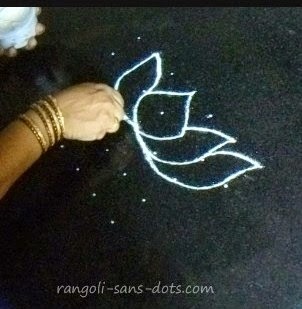 Two intermediate steps of the lotus rangoli or kolam are shownin the image above. 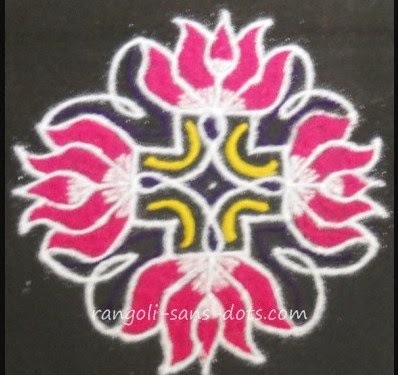 This lotus design can be drawn for Sankranti muggulu with dots. 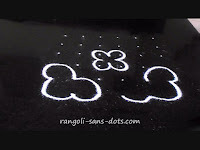 I would like to post some simple kolam with dots ( or simple chukkala muggulu in Telugu ) because I have received many requests from friends and viewers. 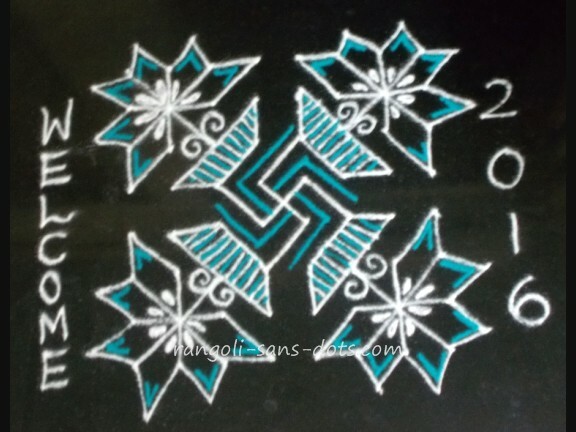 Almost all kolam I have drawn for Margazhi month are free hand designs. 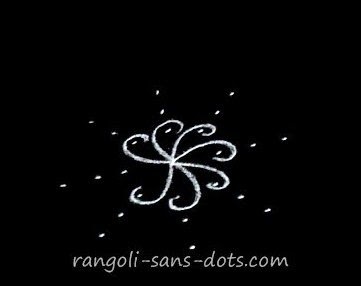 However I want to limit the number of dots to 15 in this post, to make the rangolis simple so that I can devote a separate post for bigger rangolis.. Also I have not limited the design at the plain stage but filled with some colours. 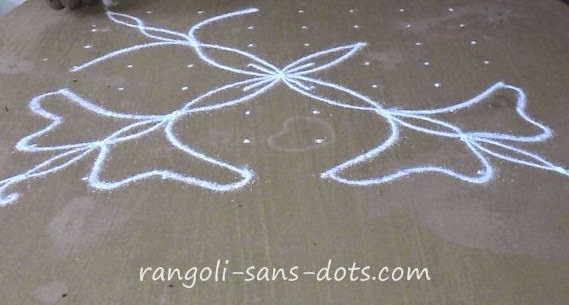 All rangolis in this post are creations (!) of my own imagination so please bear with me. 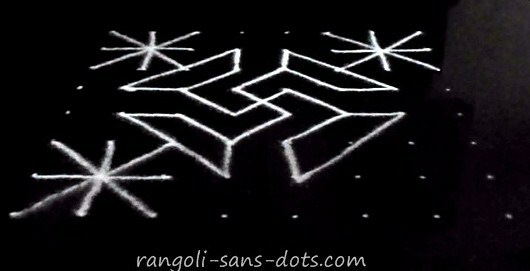 Once one becomes relatively comfortable with free hand rangolis it is some what easy to create rangoli with dots. 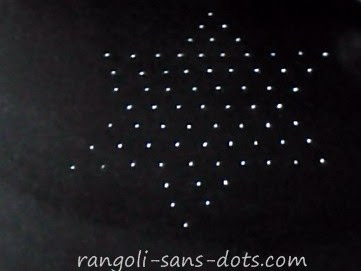 What we have to do is to imagine the design of our choice and try to fit it into a dot pattern. 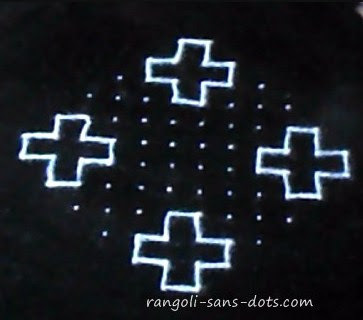 It is easy for smaller kolams with less than 15 dots and easier for kolams less than 10 dots. 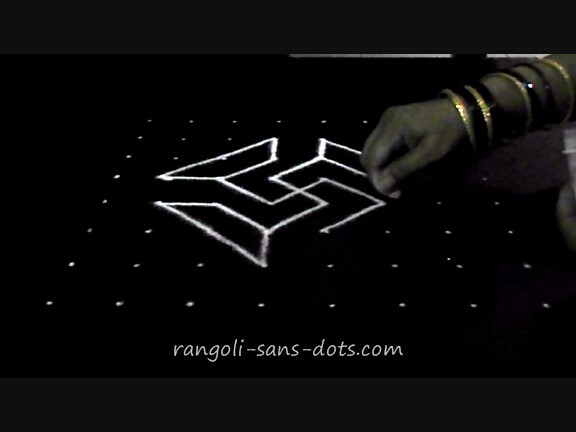 I have shown some examples in previous posts how a free hand rangoli an be converted into one with dots. The "lotus kolam", and the "butterfly and flower kolam" are examples. 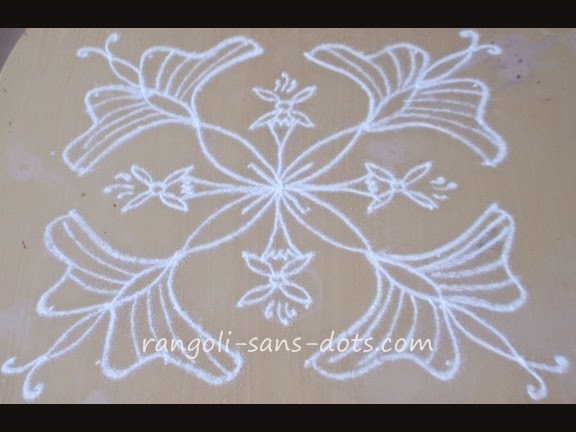 Similarly it is possible to convert other kolam ( please note that I use the words rangoli and kolam because I do not differentiate between the two though there may be differences in classic explanations). 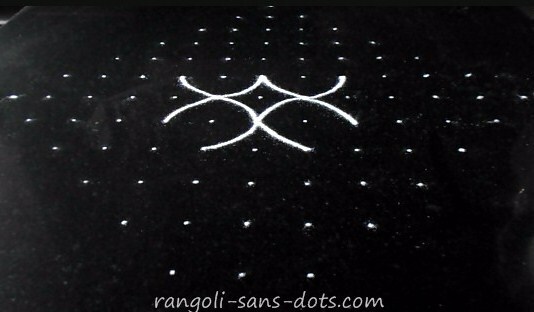 Obviously, all rangoli with dots can be converted into free hand type. Here is a collection of some rangolis. 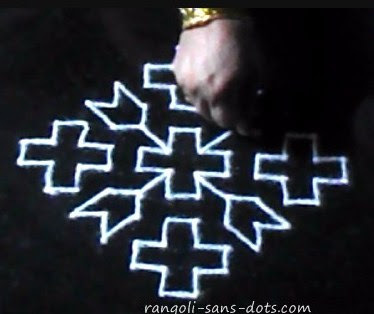 Probably you will observe that there is a bias towards free hand designs even in these because that's Rangoli-sans-dots. 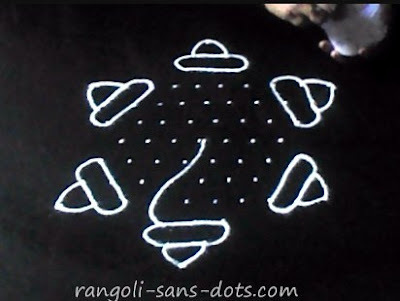 The rangoli above has been drawing using dots of 13 to 1 dot pattern (ner pulli). Draw the birds (ducks) first on the outside. 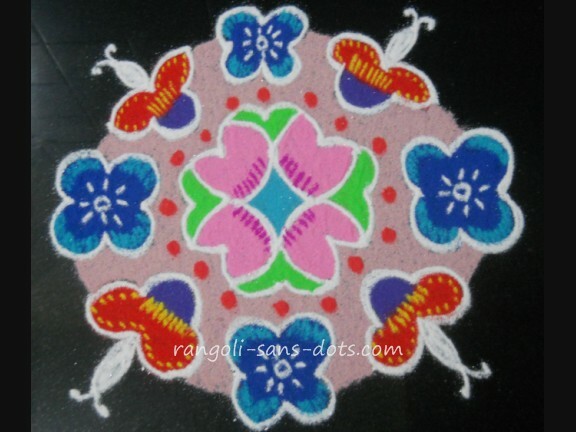 Then add the simple flower at the centre. 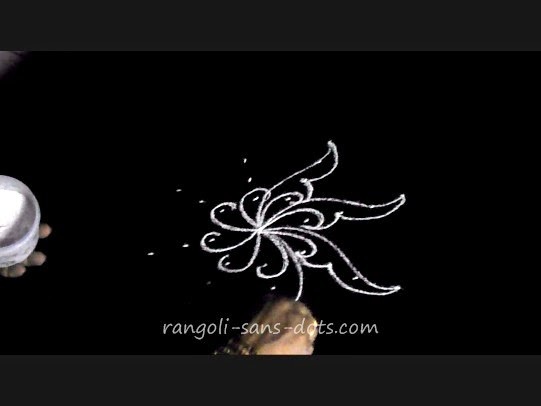 I have chosen a floral petal design we can use any other design according to our imagination. 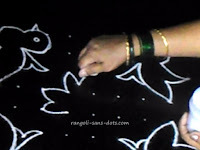 Connect the birds with petal patterns to use the dots. Add colours as shown to complete the design. .The black and white image shows the rangoli stage after the ducks are drawn. 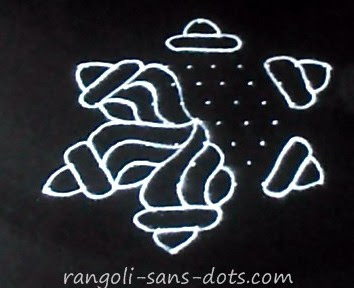 The remaining dots are used up as shown in the completed rangoli in the image at the top. 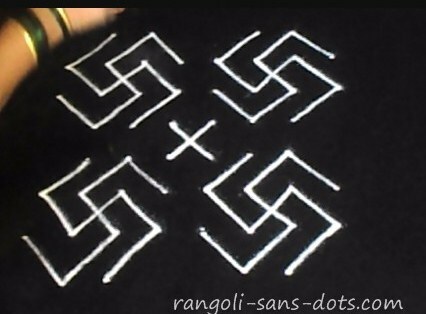 This rangoli for Diwali is drawn using the swastik and diya or divaa. 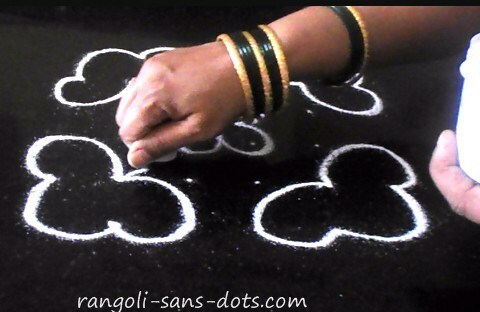 The importance of these symbols in India has been emphasised many a time. 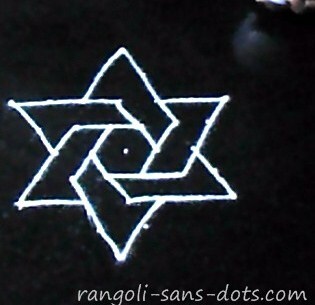 Diya rangolis are very much sought after particularly during Diwali and Karthigai Deepam.. This rangoli or kolam design is quite a common design The first image shows the dot pattern. 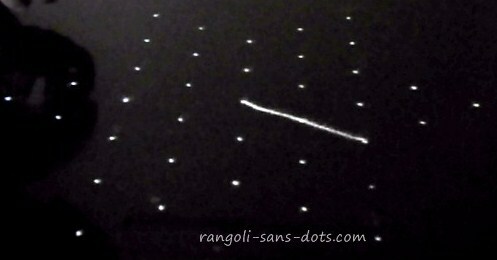 We have to place 6 by 6 dots with a pair of dots outside the dot grid - on either side of the edge of the dot grid. Draw the swastik patterns and and lamps and fill with colours. 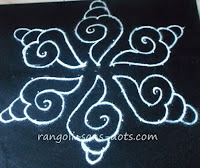 The same dot pattern can be used to get another simple kolam with maavilai patterns at the edges instead of lamps. 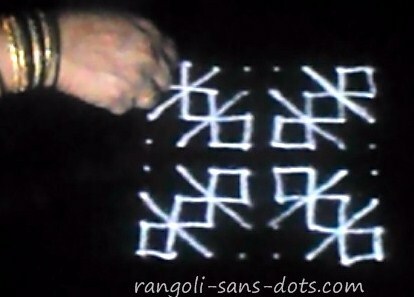 The images below show the steps. 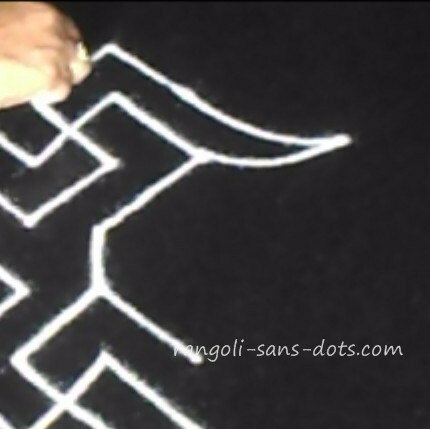 After placing the dot pattern. 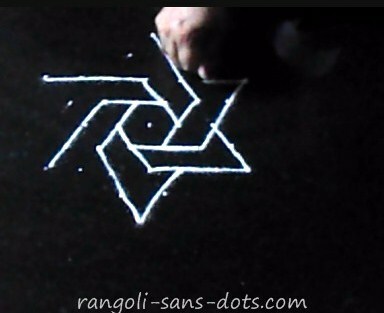 Draw the designs with straight lines on the four sides. Finally use up the dots at the centre. 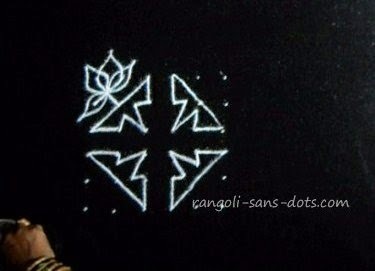 The open spots can be converted into maavilai designs as we say in Tamil. 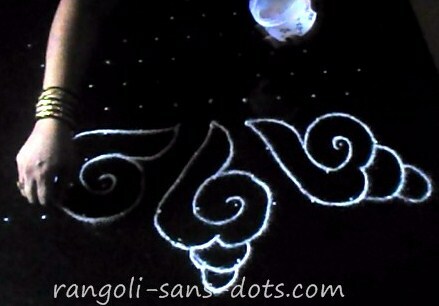 The rangoli below, free hand type and simple drawn for this post. 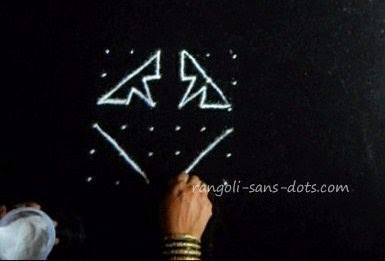 Draw two inverted triangles and then draw the hexagonal pattern outside to obtain the geometric pattern. 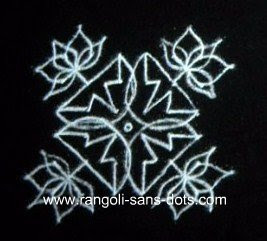 At the edge of each triangle draw floral motifs and on the edge of the hexagon draw spiral patterns. Fill with colours as desired. video gives an idea of the type of videos available. 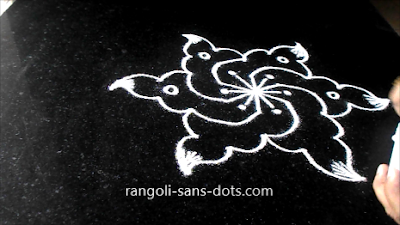 Some plain kolam versions of the colourful designs I have uploaded under 6 dots rangoli category in Rangolisansdots. Two images showing the steps if you need them. 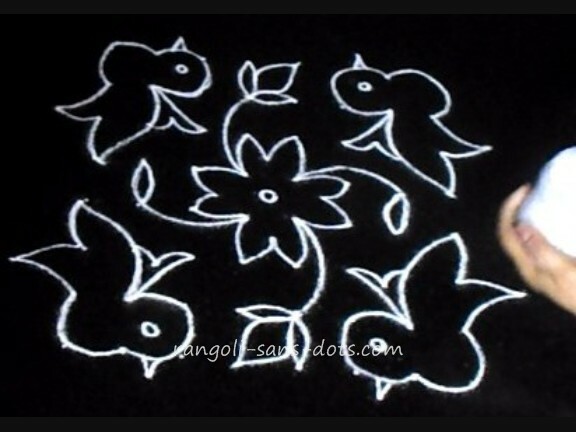 A butterfly kolam can be drawn with just 6 dots . 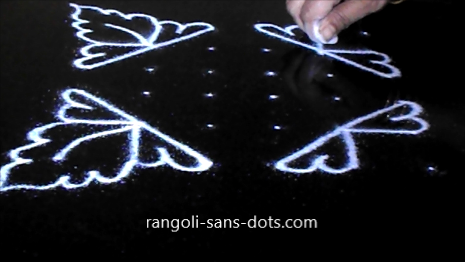 If we are looking for simple kolam with dots for festivals like Pongal or Sankranti some of the kolam or muggulu in this post may be useful. The colours used in the butterfly kolam as shown in the final image makes it suitable for a simple Independence Day or Republic day kolam. 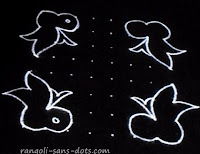 The images show the steps for this simple kolam with 6 by 6 dot pattern. We can add colours and show off this simple and beautiful kolam for festivals like Ugadi , Tamil New Year. 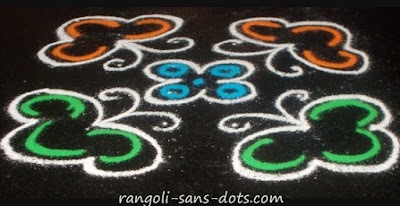 There are many common kolam with 8 dots pattern. It is ideal to chose a square grid for even number dot grid for obvious reasons. 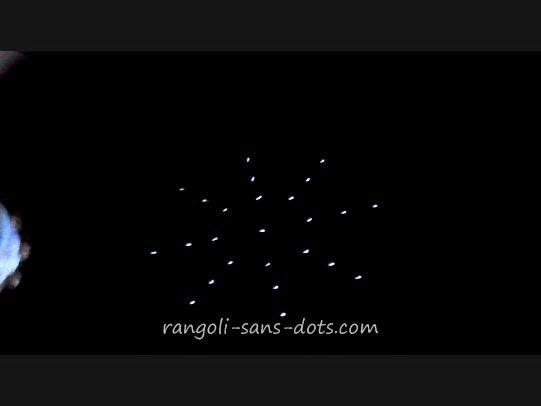 We can get a single dot as the number of dots descend in idukku pulli where as in ner pulli kolam we will be left with two dots at the bottom and top. 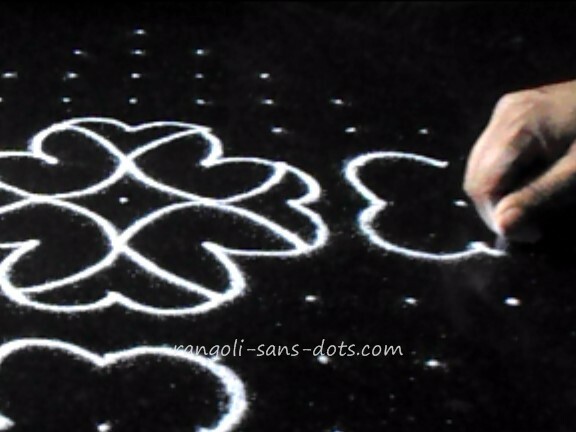 It should not be a problem if we are able to use up the dots with some symmetry because it is not a good practice to erase the remaining the remaining dots after drawing a kolam. 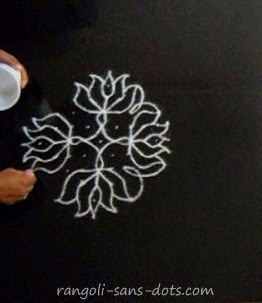 The kolam with some butter fly and floral patterns. Start at the centre and draw the four butterfly patterns on the four corners of the square grid. 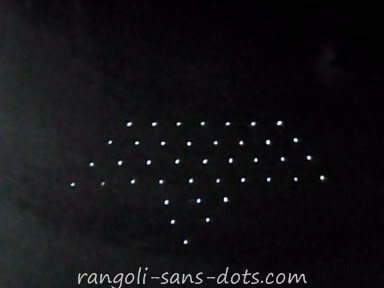 Use up the remaining dots as shown in the second photo. 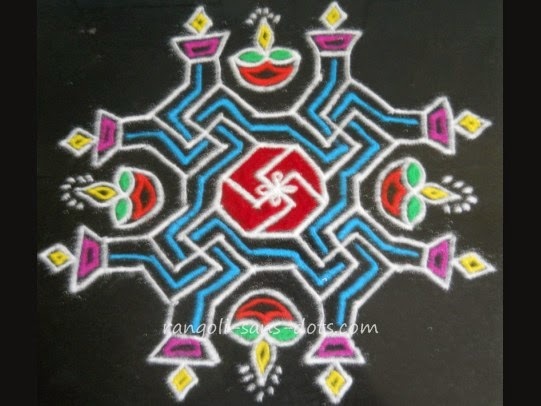 The completed kolam as in image three. Instead of adding colours I have added some random straight lines on the wings of the butterflies. 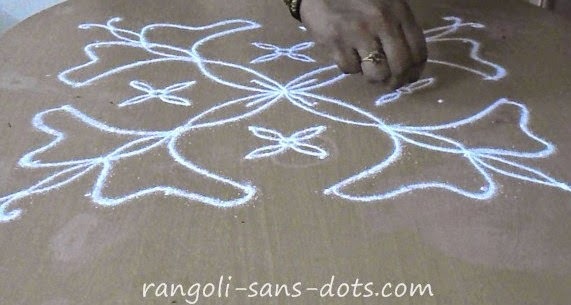 A easy kolam in case we are looking for an easy one for Margazhi . 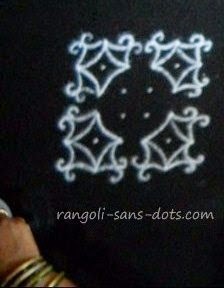 Another 8 dot kolam, the dot grid used is 8 by 8. The final image represents a simple Maharatrian rangoli with dots where we usually have square dot grids to form simple geometric patterns to get a geometric design rangoli. 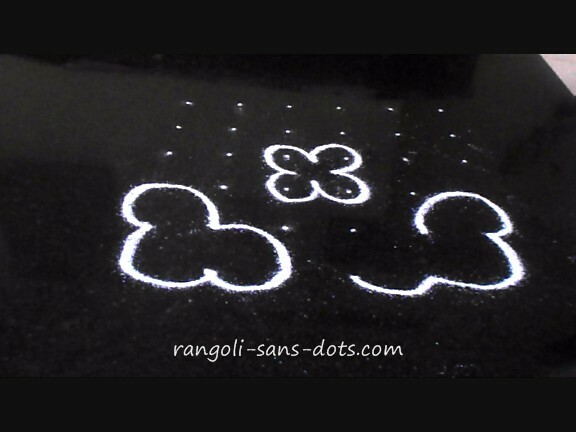 The three images show the steps for this simple rangoli. 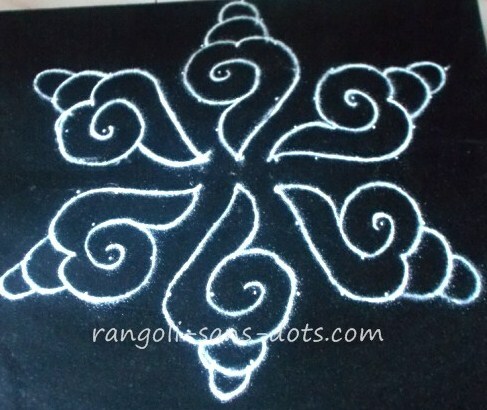 Some of the kolam designs available here may be suitable for simple kolam designs for New Year 2016 or as simple Pongal kolam with dots aka simple Sankranthi muggulu with dots. 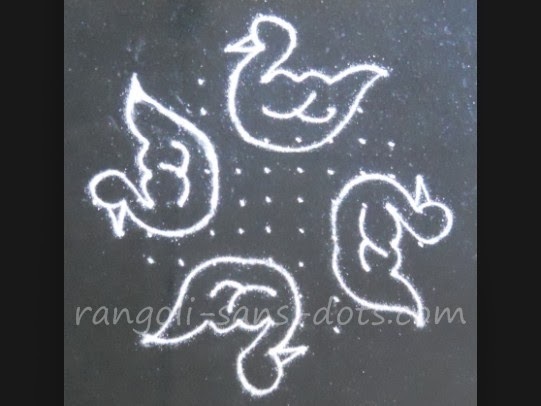 One such simple kolam in this gallery of rangoli designs with dots is a 8 dots birds kolam drawn below. 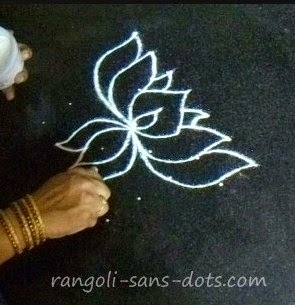 As is common in Rangolisansdots the intermediate steps through photos or pics are shown so that they will be useful for starters or learners to learn kolam. 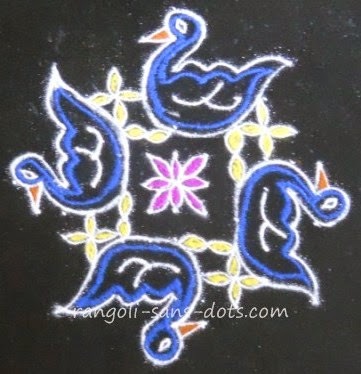 This is a common birds kolam with 8 by 8 dot grid. 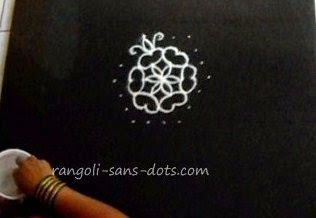 Though the dot grid small and the kolam is simple this designs with bright colours can be drawn for Pongal rangoli or kolam, Sankranthi muggulu too. 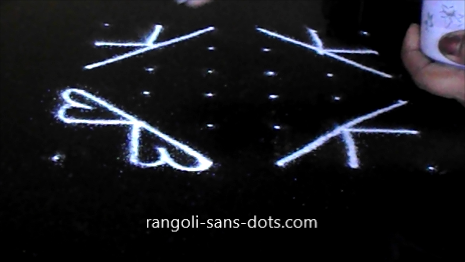 Another varation of the sangu kolam with dot grid 7 dots at the centre with 8, 9 and 10 dots on either side - idukku pulli with 3,2,1 dots starting from the gap between the 4th and 5th dots as shown in the series of steps below results in the sangu or shank designs touching each other . 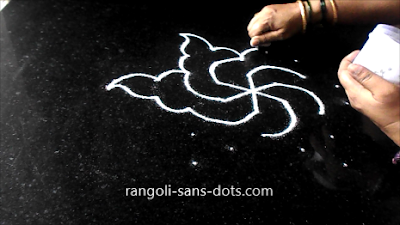 A different type of sangu kolam that may be drawn for festivals like Navaratri or Krishna Janmashtami. 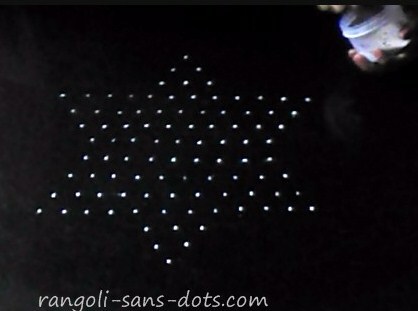 Star dot pattern is used in many rangoli or kolam. 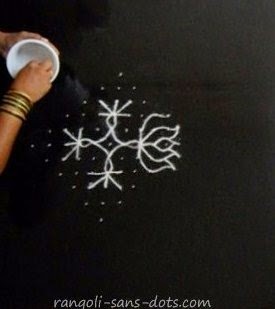 The images below show the drawing of a basic star kolam with maavilai techniques. Another kolam using the basic star pattern is shown in the images below. 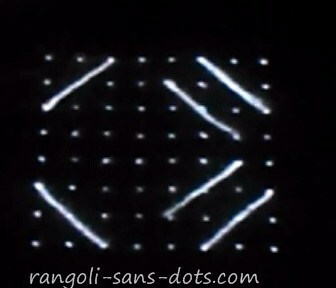 The dot grid used is 1,2,7,6,5,6,7,2,1. The dots are connected with lines as shown to get the simple kolam. 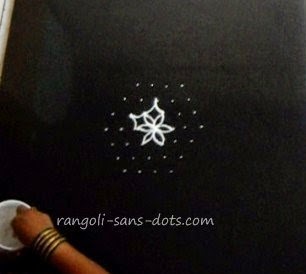 One more kolam with a star dot pattern - the dot patternis 7,6,5,6,7 and then 2 and 1 dots on either side as in the above kolam designs. 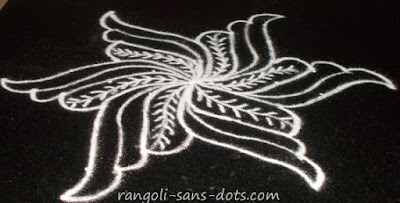 We can get a simple and beautiful kolam. 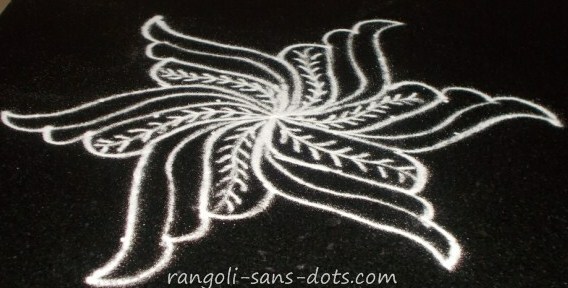 Add some decorations inside or outside the kolam . 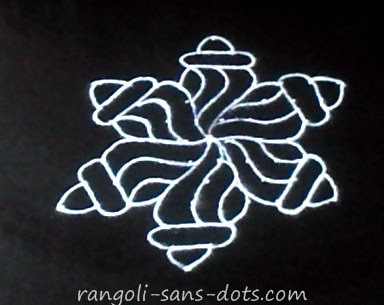 This kolam can be drawn as a rangoli at the entrance given its simple nature. This is a 13 to 1 dots butterfly and flower combination in kolam. 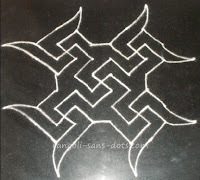 I have already drawn this kolam with double strokes. 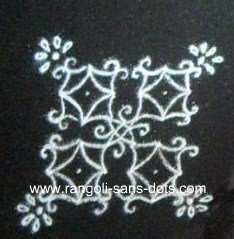 This New Year special kolam is with single lines to make it some what easier. 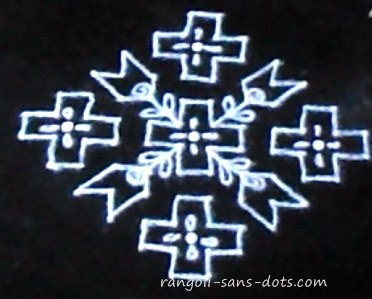 Place the dot pattern 13 to 1, then draw the central patterns, then draw the four floral patterns. 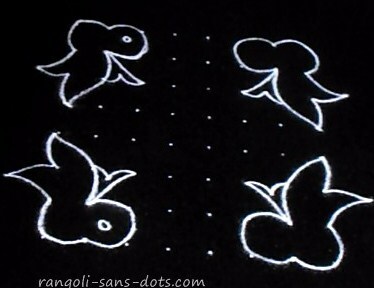 In the remaining gaps draw the simple butterfly designs. 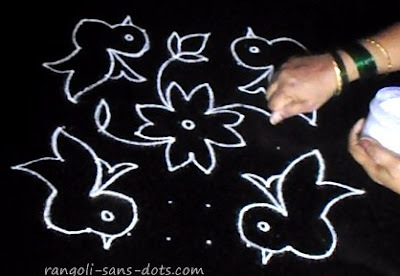 Once we add colours the kolam will become very beautiful and may in fact become the best kolam design in our street for New Year (puthandu kolam as we say in Tamil ). We can add the words Happy New Year or Welcome New Year 2013, 2014 or 2015 depending upon which year we are in. This is a common kolam with 8 by 8 dot grid that has been modified for New Year 2016. 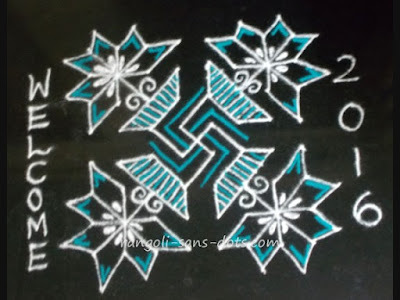 Similarly we can draw any kolam around which we can add the words Welcome 2016 or New Year 2016 instead of writing them inside the kolam using the dot pattern. 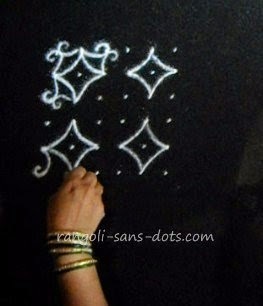 The images show the steps for this rather easy kolam, easier because only straight lines are involved. 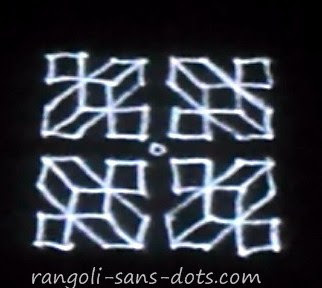 This is a collection of simple 30 plus simple kolam using 4 to 9 dots grid in my video channel on YouTube. 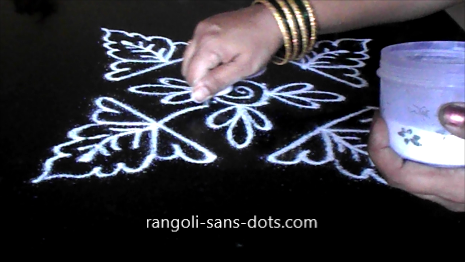 This will be useful if you are interested in learning simple kolam . Actually over a period of time this has increased to 108 videos as I have been regularly adding to this collection.